Sometimes it is quite difficult to be certain of the identity of a god, especially if there is no coloring, as is the case with most pieces of sculpture, for the same ornament, in different colors, may be characteristic of two different gods. 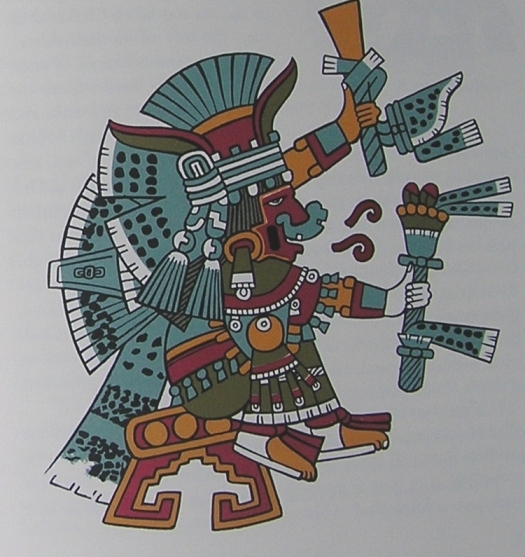 In beginning the study of the complicated Aztec pantheon, one must take into consideration the fact that the various gods, in sculpture and in the paintings in the manuscripts, are always identified by specific articles of clothing, and sometimes by the objects they carry in their hands. One rarely finds representations of the gods with their hieroglyphic names, which are the same as the days of their birth. As a rule, it is necessary to analyze the many details of a god's attire in order to identify him. Sometimes it is quite difficult to be certain of the identity of a god, especially if there is no coloring, as is the case with most pieces of sculpture, for the same ornament, in different colors, may be characteristic of two different gods. For example, a kind of pleated paper fan worn on the back of the neck is a characteristic of the water gods, the gods of the mountains, and the gods of vegetation. This fan is white for the goddess Iztaccihuatl, the snow-capped mountain; red for Chicomecoatl, goddess of corn; blue for Chalchiuhtlicue, goddess of water; and green for Tepeyolohtli, god of the mountains. 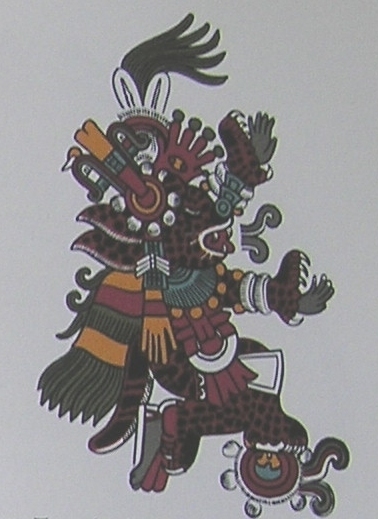 A description of Quetzalcoatl as he appears in a painting in the Codex Borbonicus [A pre-Columbian codex now in the library of the Chamber of Deputies, Paris.] will furnish an excellent example of the complicated attire of the gods. The body and face of the god are painted black, since he was the pre-eminent priest and the originator of the self-sacrifice which consisted of drawing blood from the ears and other parts of the body by pricking them with maguey spines and eagle or jaguar bone needles. Hence we see a bone in his headdress, from which hangs a green band terminating in a blue disk—the symbol of the chalchihuatl, "the precious liquid," human blood. As further sacerdotal attributes, he carries in one hand an incense pot with a handle in the form of a serpent and in the other a bag for copal. Covering his mouth there is a red mask in the form of a bird's beak, which in some representations is also set with the fangs of a serpent. This mask identifies him as the god of wind, in which form he was worshiped under the name of Ehecatl, meaning "wind." On his head he wears a conical cap made of ocelot skin, called ocelocopilli; it is tipped with a turquoise ornament and held in place by a tuft made of loops. The breastpiece edged with shells, the bracelets, and the ankle bands are likewise made of ocelot skin. His breastplate, called ehecailacacozcatl, or "breastplate of the wind," is formed by the transverse cut of a large sea shell, and his earplug is a turquoise disk from which hangs a red tassel and an object of twisted shell called epcololli, "twisted shell." On the back of the neck he wears a panache made from the black feathers of the crow and the large red feathers of the macaw. This ornament, which appears in a painting in the Codex Borgia, symbolizes the sun at night, that is, the dead sun. 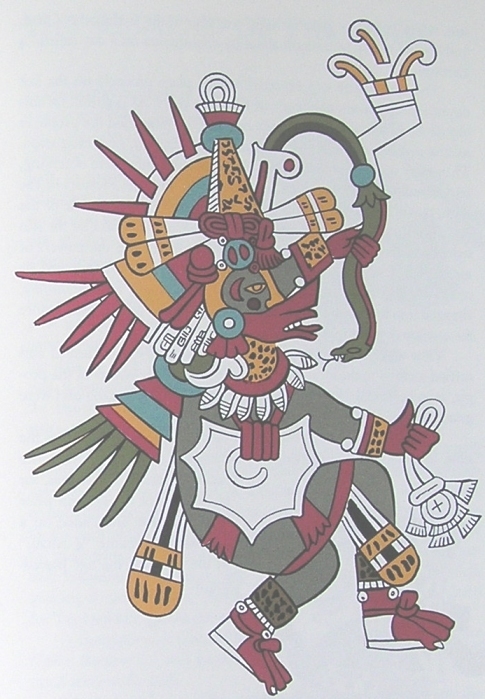 In other paintings, Quetzalcoatl generally wears a beard, not because he was a European, as was previously believed, but because as a creator god he was portrayed as an old man and consequently bearded, just as the gods of antiquity are portrayed, especially the most primitive gods.